HISTORY: Sika was found by a foreigner who travelled to the village of Sikalabaan, in Pensiagan district, one of the most rural areas in Sabah. He had visited BSBCC before. He decided to call BSBCC and asked us to rescue this bear cub. He saw that the bear cub was being kept in a chicken mesh cage as a pet. She was previously fed with condense milk, fruits and cereal. PERSONALITY: Sika has stolen our hearts with her beautiful blue eyes. She is developing into a lovely and playful bear. She loves to play with small decayed wood, it is like a blankie for her. Other than that, her favourite toy is a heart shaped honeycomb. She enjoys playing for hours by biting and swaying the honeycomb while lying on the hammock platform. She shows curiosity with everything. She is brave and accepts everything on offer. She just cannot stop exploring either the environment or the enrichment. Sika has an amazing ability to climb high and hang on the platform. She is developing her muscles every day. She loves to play on the hammock with a hind leg hanging out. She will put her front paw in the fire hose pocket and Aussie Dog Ball to grab the nice treats within. In quarantine, Sika loves to spend play fight with Kina and Diana. They seem to get along well and explore in their own world of fun. 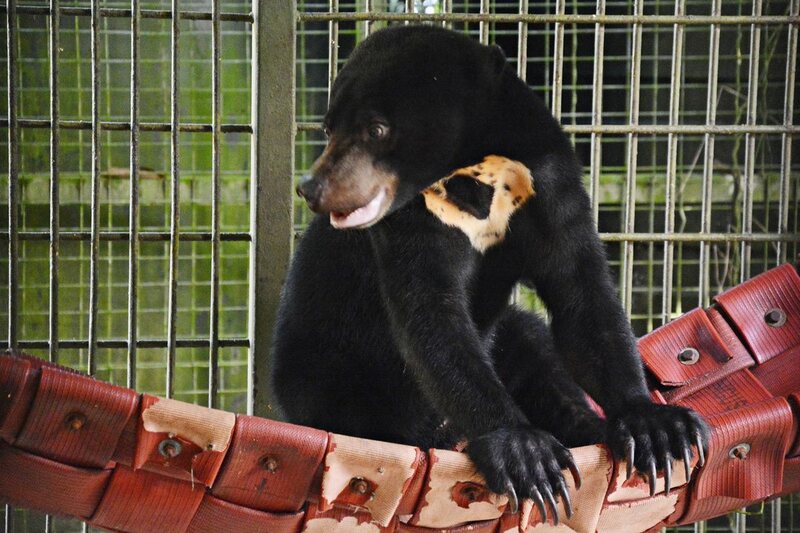 ADOPTION: Sika was adopted by Sun Bear Sunscreen through the My Bear Adoption Programme.